We carry the entire Brunswick range, which is available exclusively through Home Leisure Direct in the UK. The Brunswick Billiards brand is renowned for manufacturing top quality games room products that you can be proud to have in your home. 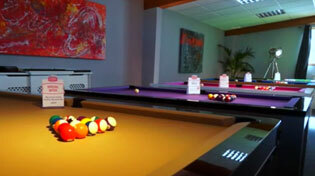 Their range of pool tables are truly unique in quality and design and are now exclusive to Home Leisure Direct in the UK. Brunswick pool tables are hand made in the USA, with top quality materials, by craftsmen with years of experience, drawing from techniques passed down through years of games room manufacture since 1845. They come with a unique lifetime warranty and come in a variety of designs, both contemporary and traditional. Brunswick Billiards have two ranges of luxury pool table, the Contender series and the Authentic series, that vary in materials, build technique and price. The Brunswick Contender series are high quality and made for recreational play. They are durable and strong, with a high quality sectional slate for great game play and give great value for the price conscious. The Authentic Brunswick range makes no exceptions on quality, made from solid wood with genuine leather pockets and Mother-of-Pearl sights among other features depending on your choice of table. Built using traditional construction methods, they are really hardwearing tables, made to last generations, aging well through being made from natural products and, of course, give a fantastic performance. For more models from this manufacturer please see our Brunswick section. Here at Home Leisure Direct, we are passionate about the Brunswick pool tables range and have two on display in our Bristol showrooms. We have selected one of each of their ranges, so you can see that quality of make of both and decide which model is best for you. We currently have the popular Black Wolf American pool table, from the Brunswick Contender range, and the beautiful Brixton American pool table, from the Brunswick Authentic range. So if you're thinking of buying a Brunswick pool table, pop down to our showroom, or contact our friendly sales team for any questions you may have about this great brand.